So the last day or so, I was reminiscing over some of the old house music tracks I either have or used to dance to. On my own facebook page, I posted youtube links to four separate vids that showed the talents of one Kenny Dixon, Jr. - otherwise known as Moodymann. Well, while perusing through some of his old records on the discogs site, I found a few gems. Then, I ran across some folks making a claim that he had remixed Sade's "By Your Side". Well, that claim has been proven false, however. To be honest? The remix just doesn't have the typical Moodymann sort of sound to it. Instead, it's from the boys at Naked Music, which makes much more sense, if you think about it. Anyhow, that will be one of the tracks listed here. The other is possibly the most well known of all of Sade house remixes. Ben Watt is part of the duo Everything But the Girl, and can you all believe the man is pushing fifty years of age? Wow. Makes me feel that much older, to be honest. Well, here you have his Lazy Dog remix of "By Your Side", which has easily withstood the test of time. I played this track once at a small gig for a friend a few years back, not realizing that this song was a personal fav of his and his wife's. So this one is, in a way, going out to Danielle and Fran. A great and unbelievably happy couple that just amazes me with how they do it. 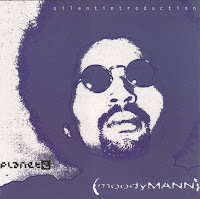 Since I mentioned Moodymann, I think it's only fair that I post one of my personal favorites of his. It's the typical Moodymann, as it's along the lines of "Shades of Jae" in that it works best as a tool over other tracks, but in the right place? It works on its own. Here's "I Can't Kick That Feeling When It Hits". Seriously a legendary tune. You'd be making a mistake by at least not taking a listen. And I'm in a subdued state. So no smartass comments this week. Just make sure you support these guys. Good stuff man! Keep it going strong.